When Darkest Dungeon came out I immediately fell in love. It was just the right blend of cell shaded art, steampunk, rogue-like, and pithy narrative. I also had a certain degree of hate and frustration because the game was just that damn challenging. It was a good sort of hate though. Darkest Dungeon is a game unlike anything we’d seen before or since. 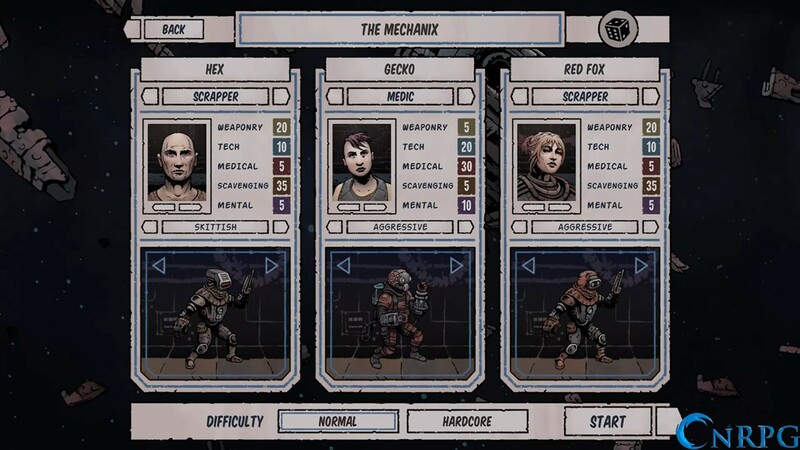 Perhaps it was with thoughts of, “What would happen if we took Darkest Dungeon and spiced it up with elements of Games Workshop’s classic Space Hulk titles?” that Snowhound Games began development on their “rocketpunk” title, Deep Sky Derelicts. In Deep Sky Derelicts you take the role of a member of a salvage team in a dystopian future where there is a wide class divide. A member of the ruling council of the upper class comes to you with an offer that he doesn’t seem to believe you will refuse. For a couple thousand years, a certain mothership has been floating around the inky blackness of space, and you are tasked with finding it. You’ve heard of the mothership, but in the way that children hear of killer robots waiting to eat them if they leave the bay doors open at night. Now this upper class snob wants you to go find it? Ahh but there’s a carrot: If you can locate the mothership, he’ll give you and your entire crew Citizenship, with a capital C, as well as enough resources to enjoy your new station in life. Character creation actually happens before you enter the game. It’s actually a system that looks similar to RimWorld or Oxygen Not Included‘s creators, though with less randomness from character to character. You get 3 troops to bring with you, and you must select a profile face for each, a class, armor color, plus a personality trait that will give them a bonus. If you don’t feel like choosing, there’s a random generation button that looks like a 6 sided die in the upper right corner. It will even randomly assign you a team name! The most significant portion of group creation is definitely your class loadout. This is going to affect your combat and even exploration strategy for the rest of the game. The classes are: Leader, Scrapper, Bruiser, Medic, Technician and Tracker. The first major difference between the classes is how their stat priorities are allocated. There are 5 statistics: Weaponry, Tech, Medical, Scavenging, and Mental. Each of these relates to a category of card, which I’ll explain momentarily. In addition, Mental affects how much money you get from selling things and from missions, while Scavenging affects how much scavenge you obtain. Each class also has a specific set of things they can equip. Every character gets at least one shield generator, and a weapon (or two). Some also get a tool, such as a “medical tool”. Your gear ultimately determines the cards that you actually have in your play deck. 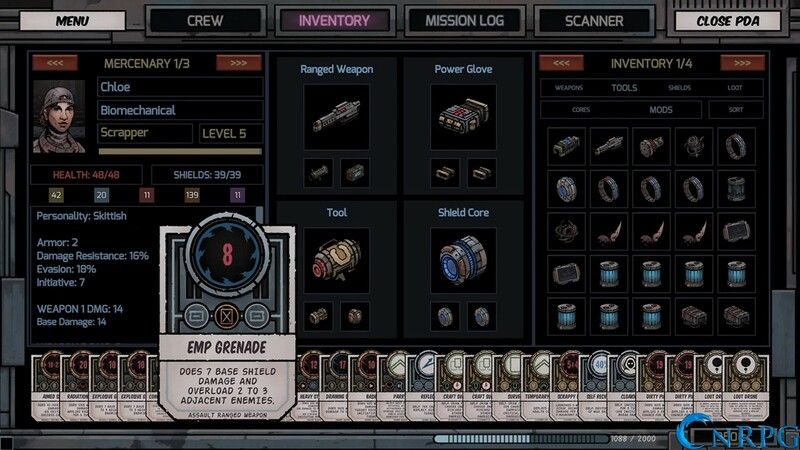 For example, weapons will give you Weaponry cards based on the type of weapon it is. A pistol might have single shot, double shot, and triple shot. A shotgun would have single shot and spread shot. A tracker’s rifle might have single shot and aimed shot. As I said before, the card types are tied to a statistic as well. So if you have a high weaponry stat, such as the Tracker or Bruiser, you’re going to do more damage with each hit. The technician’s high Tech skill will allow him to return more shield strength not only to himself, but to others when using his tech tool. As you advance in the game, you’ll find more powerful gear as well. Swapping out this gear could do more than just give you bonus stats, it can change entire portions of your deck. Since your cards are tied almost exclusively to your gear (with one card type being tied to your class) you could lose a skill that you’re very fond of. It can make choices between pieces of gear rather difficult. Thankfully, you can also acquire mods for gear. Each piece of gear has two mod slots, which just opens up your tactical possibilities even farther, truly allowing you to fine tune your strategy. This is one thing that frankly I absolutely love about Deep Sky Derelicts. Progression in the game also includes leveling up your characters, provided you can keep them alive that long. Each level up allows allocation of ability points. Each class, of course, has different abilities into which they can allocate and specialize. Once again, allowing immense deep customization. Since there are only three character slots in your party, and six total classes, you’re obviously going to have some holes. I actually love that about this game, too. There’s no real uber party you can make that will be able to do everything. Any given party is going to have strengths and weaknesses, and you’re going to need to know how to play that up when it comes time to explore the derelicts. Before we jump in the space taxi (which offers free cookies and water!) and head off to parts unknown, let’s take a little look around the station that will be our home. Aside from the taxi there are five departments: The pawn shop, where you can buy and sell various items, ill-gotten and otherwise; The research center, where you can improve various technologies, such as your scanner and your energy tanks; the hospital, where you can heal injuries from previous journeys; Station Hall, where you meet your mysterious benefactor with any hints as to the location of the mothership, and to advance the campaign; and finally The Lair, a mercenary bar where you can get missions to earn some extra scrip, or hire a crewmate to replace one that has been lost or dismissed. Again, I love the art style and aesthetic here. It doesn’t quite have that Deepest Dungeon feel, or the mechanic of leveling everything up, but it’s still a very cozy little hub. So, you’ve got a full party of three scavengers, you’ve got a few extra energy cells, you’ve bought any upgrades from the shop or research pool you could, and now it’s time to explore. The taxi will drop you off on a procedurally generated derelict that you have no real information on. The first thing you’ll want to do is open up your PDA. It’s from this device that you actually move from room to room. You’ll also want to scan your surroundings regularly so that you know what you might be facing as you travel. There’s no real tutorial that I’ve found in regards to what the icons mean, but it’s relatively self explanatory. A flat line means that there’s something that can be searched. A point down triangle means there’s some sort of life form you can interact with. A red tile means that whatever is there, it’s dangerous. Blue lightning bolts are a bit special. They’re areas that have power surges. Power surges can affect your combat, as well as allow you to use certain items out of combat like rescue beacons and shield chargers, and are very very important to keep track of. If you see a square with the bottom turned vertical, that’s an entry/exit point. After you’ve visited one of these rooms the first time, not only can the taxi extract you from this spot, but it can drop you off here as well. This is important because energy usage on derelicts will play a vital role in your strategy for exploration, not the least of which because recharging your energy on the station (or the taxi) costs credits. Energy is the resource that powers your suit’s life support, your combat capabilities, and your scanner. Anything you do onboard a derelict, pretty much, is going to cost you energy. Keeping an eye on it is crucial. If it runs out, and you have energy cells in reserve, you will automatically use them. If not? You will quickly die. It’s that simple. Always be mindful of your energy as you’re exploring. You can occasionally find power plants on derelicts that will boost your energy as well. These are very welcome sites. Try using the when your energy is at least half depleted, so as not to waste them, as they are one use only. The last thing I want to touch on, and that I really really enjoyed, is the combat. As I said earlier, you’re granted cards that represent your abilities. What does that actually mean? Well, when you enter combat, you draw cards from your deck. 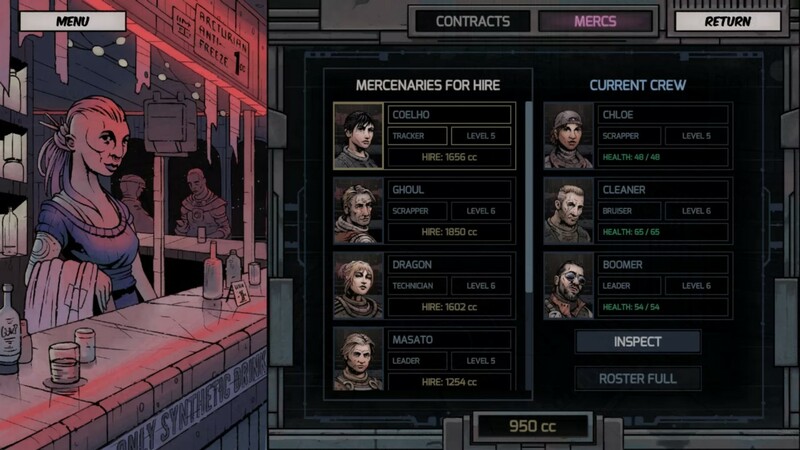 I’ve seen this sort of mechanic used in games before to determine what sorts of abilities you can use, but never in this style of rogue-like RPG, and I found the way Deep Sky Derelict makes use of it very enjoyable. Each character, friend and foe, is given an initiative score. Turns progress based on this score, with each drawing at least one card, and then playing one card. This can take all of your finest laid plans and put them on their head if you don’t draw the card you need. Cards are played by clicking the card, then the target. Quite simple. The card resolves in a flashy style that is half Deepest Dungeon and half comic book, and I found it quite endearing. What can I say? I loved this game. I loved the strategy, I loved the art, I loved the minimalist animations, I loved the rocketpunk setting, I loved it all. It’s got the right amount of challenge without making me want to curl up in a ball and sniffle (looking at you Deepest Dungeon). After you finish the campaign mode, you can even jump into the Arena for some quick battles just for fun, and see exactly how far you can progress – great for a one off session. 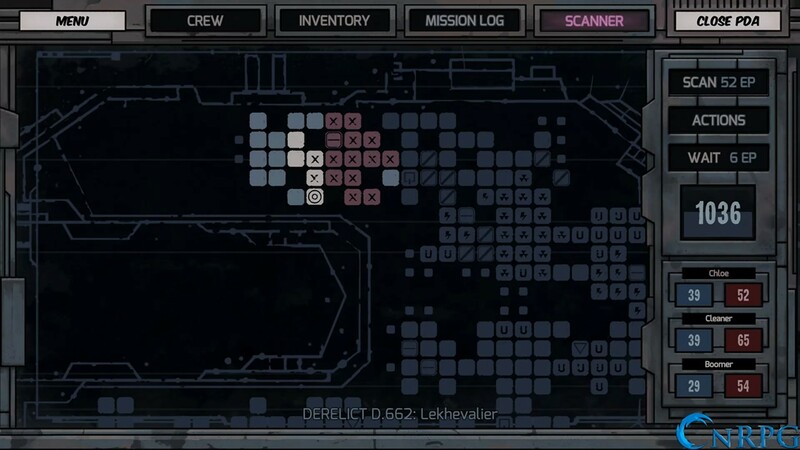 I give Deep Sky Derelicts 4 out of 5. They didn’t break ground, but they took a lot of familiar things and applied them in a new way, and did it in such a fashion to deliver a very enjoyable experience, especially for a 20 dollar game. A game key was provided for review purposes.